Local authorities in Heze, East China's Shandong Province, are ramping up efforts to close illegal marriage brokers which introduce women from Pakistan to Chinese men, as China cooperates with Pakistan to crack down on these brokers. A staffer from the Heze Civil Affairs Bureau, surnamed Liu, confirmed to the Global Times on Monday that local authorities are investigating whether marriage brokers in villages and counties under its jurisdiction are involved in facilitating illegal cross-national marriages. 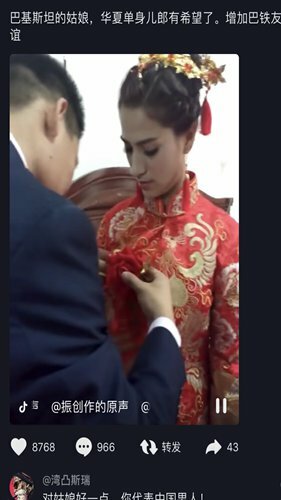 There are many videos of wedding ceremonies of Pakistani women with Chinese men on popular video-sharing app TikTok, known as Douyin in China. Many of these videos were claimed to be shot in Shandong, one of China's most populous provinces. China is cooperating with Pakistani law enforcement agencies to crack down on the illegal marriage brokers, rejecting Pakistani media reports of human trafficking and sales of organs, a spokesperson from the Chinese Embassy in Pakistan said in a press release on Saturday. "Both China and Pakistan adopt the rule of law and firmly oppose human trafficking and sales of human organs," read the release. It added that "both Chinese and Pakistani youths are victims of these illegal agents." Since February, civil affairs department, local police and market supervision departments in Heze have worked together to take down illegal matchmaking centers that involve foreigners to protect women's legal interests, the Shandong-based Qilu Evening News reported on February 26. Two illegal centers in Heze's Caoxian county, which allegedly introduced local males to females from Pakistan for a price of more than 100,000 yuan ($15,000), were raided on February 21, the report said. Some matchmaking centers in Heze spread information on cross-national marriages among young people during the past Spring Festival holidays, charging large sums of money to effect introductions to women from abroad. A marriage broker surnamed Li, who works for a matchmaker in Dezhou, also in Shandong Province, told the Global Times that it is not easy for local men to find a wife, especially as the gender ratio is so unbalanced. Li's center helps local bachelors travel to Pakistan to find a wife, charging 180,000 yuan for the service. This includes round-trip tickets, accommodation in Pakistan, betrothal gifts for the bride's family, fees for the bride's visa and her ticket to China. "The fees to get legal papers and certificates for women to come to China are included," Li said, a process which takes around two months. Before flying to Pakistan, the Chinese man should send photos of himself and offer certificates, photos or videos of his home and property. When the agency finds a woman who is interested in him, they will arrange a meeting, Li said. Li said that his agency had successfully introduced several couples. He promised that if the marriage does not last two months, the clients have a second chance to go to Pakistan to find another wife. According to a notice on cross-border national marriage from the General Office of the State Council, China prohibits marriage brokers that deal with cross-border marriages. "There could be transnational fraud and trafficking in women as the business of these matchmakers expands. But it's hard to gather evidence and investigate once the marriage has been legalized," Liu Yafei, a lawyer at the Beijing-based law firm Lantai Partners, told the Global Times. Embassies could work with local law enforcement departments to provide evidence of illegal matchmaking activities, said the lawyer. "We also welcome valuable clues to combat such offenses. At the same time, it is hoped that reports should be based on the facts. We hope that the public do not believe in misleading information and work together to safeguard China-Pakistan friendship," said the release of the Chinese Embassy in Pakistan. Several matchmaking agencies in China reached by the Global Times confirmed that they used to introduce Pakistani women to Chinese men, but some had stopped the business because it was too difficult to get visas.